Justin Timberlake’s book, Hindsight, came out this week. It’s being called a memoir. I don’t know who was asking for this. Was Justin ever a mystery to you? Some artists are enigmas, sure, and getting a glimpse into their minds would certainly be interesting. He is not one of them. “I’m so curious about Justin Timberlake!” is not a thing people say. But whatever, he’s out here promoting it and last night he was on The Tonight Show with Jimmy Fallon and it had to be a silent interview or something because he’s on vocal rest so there were hand gestures and signs and at one point Jessica Biel joined them for a game of Best Friends, with Jessica and Jimmy competing over who knows JT better and writing down their answers. I work in TV. This is bad TV. You know why? Because they’re not talking. Justin can’t talk so the whole point of this f-cking exercise is to fill the air with other people talking only they came up with a game that requires them to think and write while talking (this is a TALK SHOW) and they’re not thinking, writing, and talking so there are gaps where no one is talking at all and we’re just watching people write on a pad of paper and that’s the sound you’re hearing on television – the scratching of the marker on paper. Riveting! That’s a pattern no? A pattern for how women are represented in the story of Justin Timberlake. 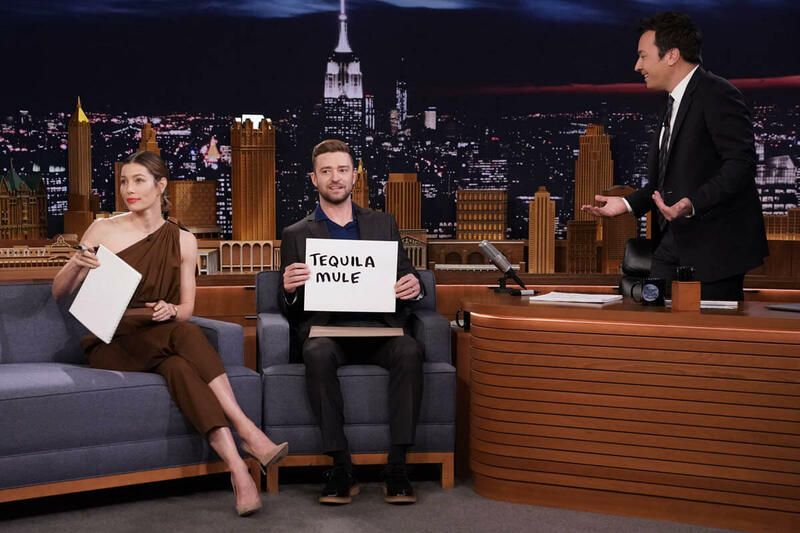 Again, nobody has ever described Justin Timberlake as having a “very dry, dark sense of humor”. He has the most obvious sense of humor. What the f-ck are you talking about?! Anyway, he was interested but he didn’t ask for her number because he said he was nervous. Sure. They saw each other again when she came to a show during his FutureSex/LoveSounds tour. He offered her and her friends a ride on his tour bus, which is when he finally asked for her number and they started talking, according to the book. After he came back from touring abroad they spent a month together. Then they decided to be exclusive, according to Hindsight. Did you catch it? Did you spot the Gossip Nostalgia there? It was a pretty big gossip story at the time. And now he’s writing about it like it’s a beautiful part of his and his wife’s origin which… yeah, OK…that might be the case, for them, but remember, he also mentions in his book the origin story for Cry Me a River, about how he channeled his hurt and rage from being betrayed by Britney (though of course he doesn’t mention her name) into the song which he wrote in two hours. Let me get this straight – it’s OK for you to drag an ex in a song and a music video but you completely gloss over the fact that you were hanging out on your tour bus and talking to and texting Jessica Biel (tantamount to emotional cheating) behind Cameron Diaz’s back…and this is supposed to be ROMANTIC!? Originally wanting to “keep people away from [Silas]” when he was born (“We wanted him to be just for us, just for a little while,” Timberlake writes), the new parents eventually shared a photo of him. Well that was fast. We went from protecting Silas to… THIS IS A WHOLE NEW ERA FOR ME. At this point, I think we have to call it for what it is: a skill. No one is better at making it about themselves than Justin Timberlake. No one. He might even be better at it than Mariah Carey. Actually, yes, I’m ready to come to that conclusion. Justin is more ME than Mimi.